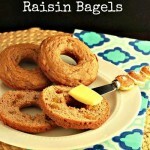 Paleo Cinnamon Raisin Bagels or Plain Bagels are a grain free breakfast treat that will remind you of the real thing. 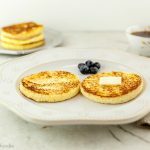 These came out so good and really have a “whole wheat” sort of flavor, but are completely grain free, gluten free, starch free, and nut free with dairy free options. 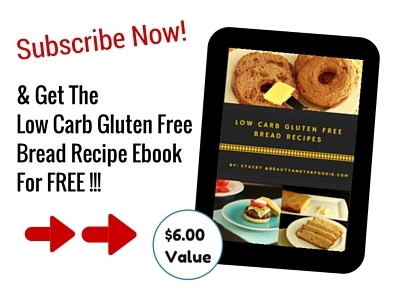 A fantastic bagel sub for people who are on a Paleo , GAPS, or Low Carb diet. 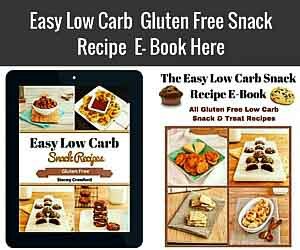 I gave a lower carb option by leaving the raisins out, and making plain bagels or cinnamon bagels, and using a low carb sweetener option. You could also make paleo plain bagels by leaving out the cinnamon and raisins. You could serve them with butter, sunflower seed butter, almond butter, coconut butter, honey, or cream cheese if you eat dairy. These can also be made ahead and frozen. Leftovers must be kept in fridge or freezer. These can be pan toasted or toasted in a toaster oven (most regular toasters will be too destructive for these). Hope you love these as much as my family does. 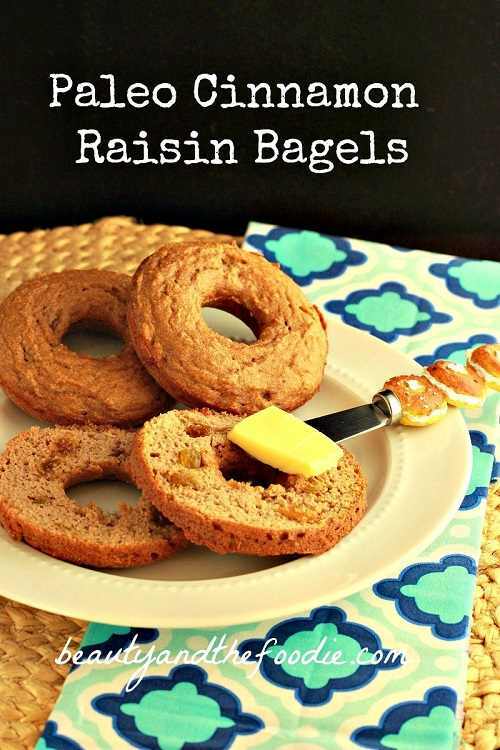 A grain free, paleo, nut free cinnamon raisin bagel with dairy free and low carb options. 1/2 tsp baking soda or can use 1 tsp baking powder. 2 tsp cinnamon. *optional omit if making plain bagels. 1/3 cup unsweetened coconut or almond milk. 1 tsp organic GF vanilla extract *optional. 1/3 cup golden or dark unsulphured raisins, or for lowest carb, omit raisins and make plain bagels * optional, can omit raisins for making plain bagels. In a large bowl combine: 1/3 cup sifted coconut flour, 1 ½ tbsp golden flax meal, 1/2 tsp baking soda or 1 tsp baking powder, 2 tsp optional cinnamon, 1/8 tsp sea salt. Mix together thoroughly. In another mixing bowl combine: 3 eggs, 1/3 cup coconut or almond milk, 2 ½ tbsp butter or coconut oil (melted), 1 tsp apple cider vinegar, 1 tbsp honey or low carb option 1 tsp stevia, 1 tsp vanilla extract. Mix together thoroughly. Add wet ingredients to the dry (coconut flour mixture). Mix together thoroughly. Add optional raisins or freeze dried (or fresh) blueberries to mixture and stir. Spoon batter into bagel or donut pan and spread around with the back of a spoon. Use a damp cloth or paper towel to wipe off bagel center. Bake at 350 F for17 to 20 minutes, check at 17 minutes. Remove from oven, and let bagels cool. Use a butter knife between bagel and pan edges, and slide around to loosen bagels. Yum! These bagels are making my mouth watery right now. I could easily eat them for breakfast with a cup of tea! 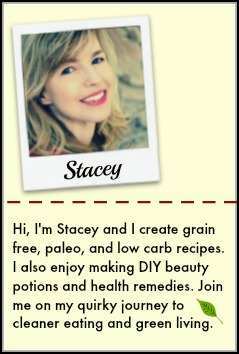 Can I use maple syrup instead of honey or stevia, Stacey? Was a little skeptical when mixing together how these were going to turn out because I’m fairly new to the gluten free baking! I love the nutty flavor, only made 5, if I put less in each ring should get 6! Not bad for first time try!! Thank you Julia for trying the recipe and your most kind words 🙂 That really made my week! Terrific recipe! I am on GAPS and this was a nice grain-free treat. I can’t eat dairy, but hope to cut, toast and top these with a smudge of coconut oil and salt (my butter substitute). I didn’t have flax meal on hand, so I ground chia seeds and it worked great. Next time I’ll try blueberry! I am seeing a pattern of recipes with coconut flour, chia/flax, apple cider vinegar, eggs and baking soda. Those ingredients seem to be magical when baking with coconut flour. Thank you very much for your recipe! I really appreciate how you include options when writing out the ingredient list. It is very helpful. I made these this morning, and they were good. I thought they were more like muffins than bagels, however. The only adjustment I made was to use cow’s milk. Does that sound about right, or might I have made a mistake? Thanks again. I look forward to checking out some more of your recipes. Sarah, thank you for trying the recipe and your kind words & feedback 🙂 I’m sure cow’s milk would work fine. They are not as doughy a texture as the bagels with gluten. Hello Stacey ! 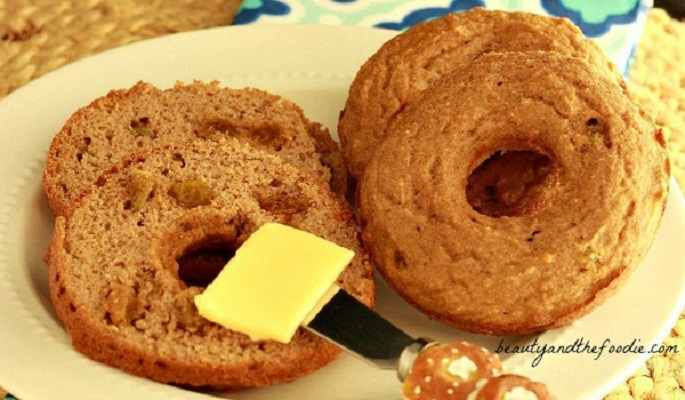 This is another new recipe for me and I need to buy first the bagel donut mold pan which I don’t have yet and I hope this is again a beautiful and delicious recipe from your account for we people. I added backing powder also so that they rose slightly to form a whole bagel. Yummy Yummy! Faith, thank you so much for trying the recipe and letting us know your results. Baking powder works well in this, and they have better “corn free” baking powder available now. love this recipe.. 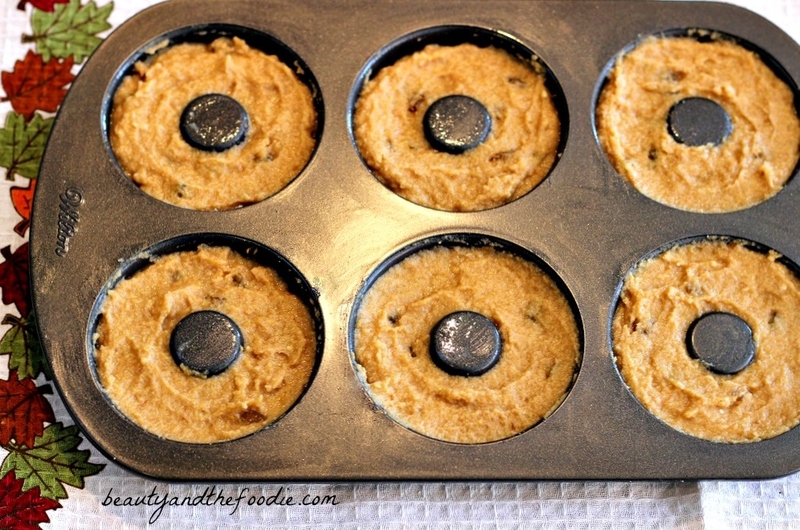 I made a double batch and cooked in a muffin top pan as I use them for a bacon & jam sandwiches. These look great! I don’t gave a bagel pan. Is it possible to form the bagel shape and bake that way? Or will the dough not hold it’s shape? Thanks! Bridget, I do think they need some kind of pan or mold to stay together. You could use a larger muffin pan though. But they won’t have a hole. Oh, boy am I glad I found this post! I have been craving bagels something fierce since going low carb a few weeks back. Thank you! I made a batch yesterday, and the texture is amazing! I made the plain version, and I thought they were delicious with one exception. For some reason, mine have a slight metallic taste. Any ideas as to why this might be? Stephanie, It is the baking soda. Try adding a little less baking soda or switching brands sometimes helps. This was AWESOME!!! The texture was great, I used 1 tbsp of Xylitol for sweetness and substituted fresh blueberries for the raisins and it turned out perfectly! Thanks so much for sharing your recipe, it isn’t often I find such a great texture when I bake low carb and grain free. It was spongy, light, and wonderful! This recipe looks lovely, I havent made bagels beore but I love cinnamon so I will be giving these babies a go, thankyou. 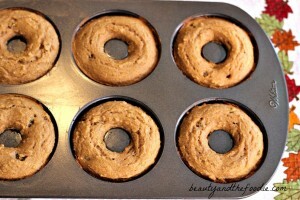 Is it possible to make this into a bread using a loaf pan instead of the donut pan? Melissa, I don’t see why not. I think it could put into a loaf pan or muffin pan. Baking time maybe a little different, so you will have to check on it. I love these! I made a batch yesterday and they’re nearly gone! I undercooked mine just slightly so they’re not exactly crispy enough yet, but I’m glad my first try gave me a great flavor and starting base! My brother (who is very NOT paleo) said they tasted almost like Dunkin Donuts cinnamon raisin bagels– can’t argue with that! Stephanie, I am thrilled that you and your brother tried these with good results! 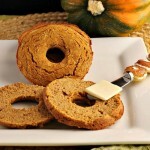 I have a pumpkin spice bagel recipe on this site that is very good too. You could also make garlic or everything bagels easily with the base recipe. Thank you for making my day with your kind words! Do you think I can use almond flour in place of coconut? Andrea, you could use almond flour instead just use 4 times as much as the coconut flour amount. I don’t know how it will taste though as i have not tried it. Will the recipe work with chia or flax eggs? 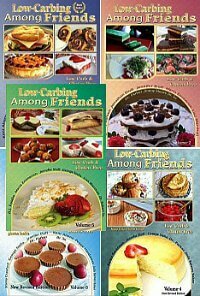 Lois, I have not had good results with chia or flax eggs in these coconut flour recipes because coconut flour needs eggs to bind together. This looks like a fantastic recipe!! One question: you list the nutritional information using erythritol, but I don’t see erythritol listed among the ingredients – just stevia. Did the recipe change around a bit at some point? Sarah, thanks for catching my typo error. It is stevia in the recipe and the nutritional info is for stevia. I typed in the wrong sweetener on the data. I fixed it. Thank you for letting me know. I was put onto a low carb diet so I have to track everything how low carb is this? Approx grams per bagel? Elizabeth, the Nutritional data was on the post, but my site crashed a few days ago and they disappeared. I put them back on the recipe at the bottom. Thanks for letting me know. I need to check all of the recipes now. anyways, The plain low carb version with erythritol is: 5.5 g total carbs and 3.9 g net carbs. Hi Shannon, there is not an exact science to scaling the recipe but there is a math equation I use when I try this. I minus a 1/3 from the total time then times buy 2 then add the 1/3 back. That is for doubling a recipe. So it comes to about 30 minutes, but I would check it at around 25 minutes. And it may take a little longer than 30 minutes. Will require a little checking here and there, as ovens vary. Is there anything I can use instead of flaxseed. My daughter is fructose intolerant and can’t have flaxseed. Melina, I believe you could try to sub almond meal or almond flour for the flax meal. Not sure if she can have that. I’m not sure that flaxseed actually has fructose in it? Carol, hope you enjoy those bagels. I will save you some next time I make them. The pumpkin ones are good too! Whaaat these look awesome, and I have all the ingredients too! 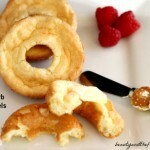 Will definitely be trying these…bagels are the one thing I miss the most since I cut out processed foods! Gabriela, thank you for getting excited. I have been trying to make decent bagels ever since I went grain free. These were great with some SunButter or almond butter. I might leave out the cinnamon and raisins next time and have some plain ones for egg bagel breakfast sandwich. Love your site and your healthy food recipes. Let me know how it goes.